Whether it is a passion for genealogical research or interest in preserving local history & traditions, we share Common Corners and Common Borders. This website reflects our combined resources, enables a network of communication and assists in discovery of our Common interests in our Corner of the world - West Michigan*. Click on any county to see specific resources. Please contact webmaster@wmgs.org if you have questions or potential contributions for this website. 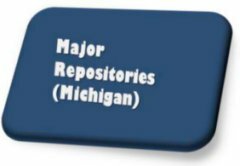 Major repositories for Michigan - New resource page. *Kent County and the counties immediately surrounding; namely Ottawa, Muskegon, Newaygo, Montcalm, Ionia, Barry and Allegan Counties. Contact the Webmaster at webmaster@wmgs.org. Copyright 2006-2019 Western Michigan Genealogical Society. All rights reserved. Revised:Jan. 25 2019.